The state of New Hampshire is a land of distinctive geographical quirks. Major physical regions in the Granite State are: the Great North Woods, the White Mountains, the Lakes Region, the Seacoast, the Merrimack Valley, the Monadnock Region, and the Dartmouth-Lake Sunapee area. The White Mountains range spans the north-central portion of New Hampshire. With an elevation of 1,917 meters, Mount Washington is the tallest peak in the northeastern US. The White Mountains are blanketed by the conifer and northern hardwood trees of the New England-Acadian forests. Both Cohos Trail and Appalachian Trail traverse through the range. The Merrimack Valley Region extends in the south-central portion of the state. Monadnock Region overlaps with Connecticut River Valley. 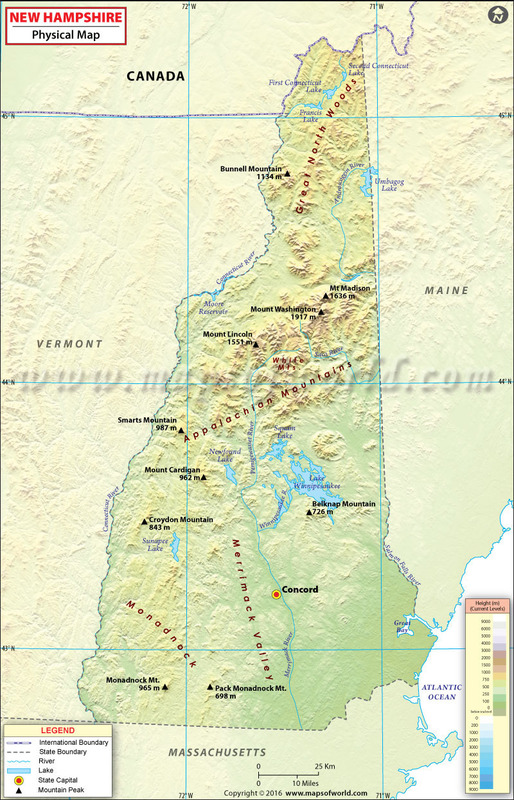 The 965-m Mount Monadnock is the centerpiece of the region. New Hampshire has the shortest coastline of any US state, with a length of 18 miles (29 km). The state's Atlantic Coast is generally rather rocky and rough in nature. The Great North Woods Region spans the northern third of the state and is locally known as the "north of the notches.″ The Lakes area is a mid-state region around Winnisquam Lake, Squam Lake, Newfound Lake, and Lake Winnipesaukee – the largest lake in New Hampshire. Squam Lake is the second largest lake located entirely in New Hampshire.